It is the jewel right in our back yard. It is a river for all seasons; The Yakima. Scaling from the forested East slope of the Cascade mountains to the farmlands of the Kittitas valley before entering the semi desert canyon as it heads south towards its final destination of the Columbia river, the Yakima river paints many faces. It has been a pleasure to learn some of the intricacies the river has and a joy to realize that the learning curve continues to bend. 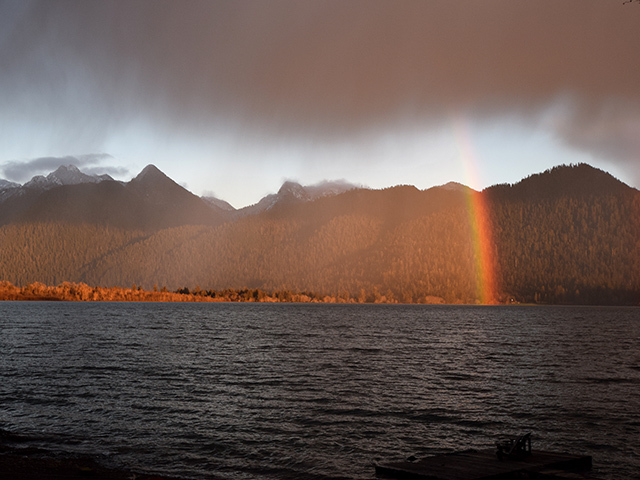 The watershed really is a gem: From the multiple eagles inhabiting the waterway during the winter, to the Bighorn sheep calling the banks its home, to the mule deer, the heron, the hawk, the cougar, bobcat, black bear, elk and the trout. From the water it supplies the farmer and the recreational venue it provides for water sports, to the basalt daisy which is only indigenous to the Yakima river canyon and the incredible white ash line in the lower canyon in remembrance of a time that man was not here and Mt Rainier deposited its mark. The river is truly a gem. It is a river of many faces from its terrain and seasons to the tactics and methodology used to fool the trout. Fishing techniques range from far and fine to chucking big uglies and all angles in between. Each season calls for its’ own repertoire. The River gives up some incredible fish. possible at the end of run-off as well as to meet mandatory minimum flows for fish habitat. Every year around the first of September the B of R performs what is referred to as the flip flop. This is when the Yakima flows are decreased from the demands of the high irrigation flows of summer to basically the mandatory minimums that have been instated. This lowering of the water is a major benefit to the spawning Chinook Salmon. The lower flows allow the Chinook to propagate successfully. The Yakima is technically a tail water that is fed by three main reservoirs.. Many tail waters are bottom fed where the Yakima is a combination of both bottom and top water reservoir releases. The Cle Elum River feeds the Yakima system and it is a bottom fed dam. Kachees and Keechelus also feed the Yakima system and they too are middle or bottom fed releases yet they both drain into one holding reservoir, Lake Easton. Lake Easton although lake like is not considered a lake but more a wide spot in the river. Lake Easton does feed the Upper Yakima Proper from a top water release and therefore warms with the air temperatures of the season. In the winter it is colder and in the summer it is warmer. One benefit of a true bottom fed tail water is that the water temps are fairly constant throughout the season, providing adequate temperature, in fact prime temperatures for aquatic insect hatches year round. Examples of bottom fed tailwaters would include, The Bighorn, The Missouri, and the Green. The Yakima being a mixture of both is more like a freestone river, fluctuating in temperatures similar to that of a river without a dam. The three main reservoirs that feed the Yakima as mentioned earlier are the Cle Elum, Kachees and Kechelus. Both the Keechelus and Kachees reservoirs are channeled into the Easton Reservoir from which the Upper Yakima proper begins. This is also the point from which the KRD cannel draws a large amount of water for irrigation purposes in the Kittitas valley. Typically the upper Yakima river proper will flow at approximately 350 CFS on average from the Lake Easton reservoir and the water they draw from the Easton reservoir into the KRD cannel during irrigation season will almost match that number! The Upper Yakima Proper before the Cle Elum River confluence is a stretch of river that flows at the most consistent level on a year average as shown in the following graph. Besides during the typical run-off season this particular stretch of the Yakima river flows day in and day out with the most consistent levels. Approximately 13 miles downstream from where the Upper Yakima Proper begins at Lake Easton, another dam-controlled river enters the Yakima. This river ( the Cle Elum) originates from a reservoir with the same name approximately 9 miles from the joining. The Cle Elum River contributes most of the water volume to the Yakima River between its confluence and the city of Yakima during the irrigation season. The flows on the Cle Elum River are very low other than during peak irrigation which is from June to September. The chart below shows the incredible fluctuations the Cle Elum River experiences. The inconsistent and major fluctuation in water flows inhibits the biomass of the river. The average flow during Non- irrigation season is 180 CFS and during run-off and prime irrigation season the river flows anywhere from 1800-4500CFS depending on irrigation demands and influx of snow melt into the reservoir. The trout population of the system is certainly less in numbers than the Yakima, due to the inconsistencies yet there are certainly trout in the river. Much of the snow that melts on the East slope drainage that feed the Yakima is caught in the reservoirs. There are however tributaries below the reservoirs that contribute to the Yakima that will add flows of significance, especially during the spring. The largest of the tributaries is the Teanaway River, which enters the Yakima approximately 10 miles downstream from the Cle Elum River confluence. Typically by the end of summer the Teanaway will be flowing at approximately 20 CFS and yet during spring run-off the Teanaway can flow up to 2,500 CFS. Other tributaries that contribute to the Yakima river below the Teanaway are the Swuak, Tanuem, and Wilson. The Tanuem could and would be a larger tributary but much of the water is diverted for irrigation needs as are waters out of many of the other smaller tributaries before they enter the Yakima. The Wilson/Cherry creek tributary enters the Yakima just above the lower canyon and is most certainly a clarity inhibitor much of the year. The Cherry creek drains much of the Kittitas valley’s irrigation canals and usually flows quite a few shades darker than the Yakima. After the confluence of Cherry Creek and the Yakima, the river is quite a bit less clear yet can produce some of the most prolific hatches. Some of the tributaries that contribute to the Yakima above the Teanaway River include, Big and Little Creek as well as Silver Creek. Average Water Clarity Chart – This graph depicts the average clarity of the entire river. The clarity designations will obviously be affected by Spring Run-off etc. Wading the Yakima can be easy and difficult at times, depending on the water flows and where you plan on accessing the river. Hopefully this chart on average river flows will help you understand the most practical times for foot access on the river. The above graph is fairly ambiguous in that a strong wader can work up a particular bank when the river is flowing at 4000 CFS; What the above graph does is describe a generalization! There are certain stretches of river that lend themselves to better wading by the nature of their design. For instance the Upper Flatlands and the Farmlands provide easier wading as an overall rule just because of size of the rocks evident in the terrain. The river rock tends to be smaller and uniform and easier to walk on in these parts of the river. Also the river braids and channels therefore promoting smaller side channels that are more easily waded. In comparison the Upper and Lower canyon rocks tend to be larger and less uniform. The river doesn’t offer as much in the way of smaller channels and is generally one big river. The following chart rates each stretch using a 1-10 scale; 1 being the worst and 10 being the best in a variety of parameters. Again, charts are a bit ambiguous in that a relatively experienced oarsman might find a certain stretch that is rated difficult to be fairly simple….and a beginning wading angler might find a stretch that is listed as easy wading to be difficult. Wading Access: This pertains to how many places a person can actually step into the water and fish. Ease of Wading in Low Water: Related to the actual difficulty of the wading. Drift Boat Ease: Has to do with if the stretch is navigable with drift boat and large rafts. Personal Boat Ease: Refers to the ability to navigate the particular stretch with a small personal watercraft. Vehicle Access: A reference to how much of the river is paralleled by a road. The river between Lake Easton and the Cle Elum River confluence flows at an average of about 350 CFS. Access is difficult in that it borders many private summer home developments. Floating certain stretches of this section is not recommended with a large raft or drift boat. From the dam down to the Washington State Dept. 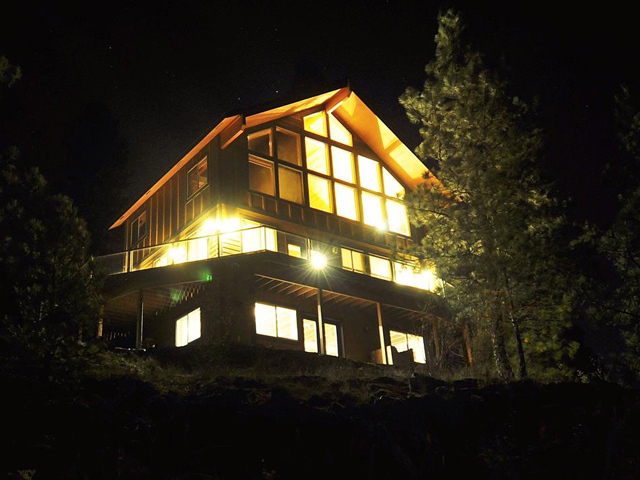 of Wildlife access just below the LDS Ranch as well as from the Bullfrog access to the Cle Elum River confluence there are many log jams and a few dead end braided channels that are definitely impassable with large rafts and drift boats. These two sections of this stretch could be navigated with smaller personal float boats, yet extreme caution is recommended and only intermediate to advanced boatman should attempt. The stretch between the State Wildlife access and the Bullfrog/ Iron Horse access is navigable by larger drift boats and rafts. 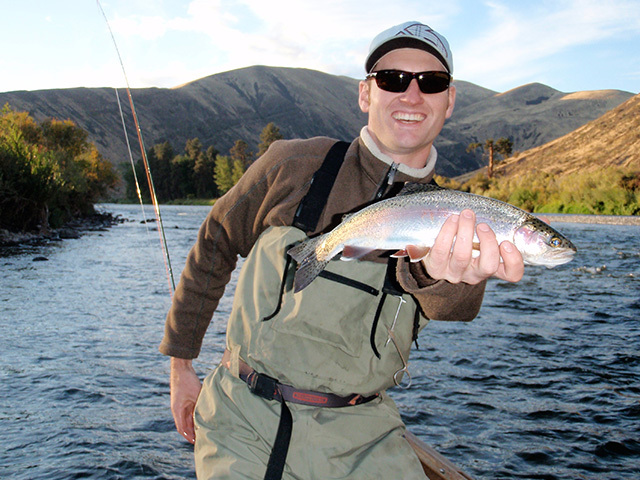 The Upper Yakima is predominantly Rainbows with a small mixture of Cutthroat, and Brook Trout as well as a few Bull Trout. The best chance to see a black bear along the Yakima is either in this stretch or the Upper Canyon. This stretch of river sports some braided channels and broad riffles. Housing some fine habitat for the wild Rainbows, Cutthroat and a few Brookies the Upper Flatland stretch has either fairly easy or difficult access. Much of the lower fourth of this stretch is bordered by private land and not easy to drive or walk up to. The section above the lower fourth is easily accessed by the Hansen pond road access that parallels the river for approximately 2 miles. Decent wade fishing even in high water and awesome wade access in low water makes this stretch appealing. Hatches are not is consistent yet can be prolific. This particular part of the river is certainly a beautiful long 14 mile stretch of the Yakima. While foot and car access is at best not easy from the semi adjacent State Route Highway 10, the John Wayne trail does parallel literally 75% of this stretch in close proximity. The John Wayne trail access is by foot, non motorized bikes and horses. Highway 10 for the most part of this stretch is a steep grade away from the river. There are points at which the river and Hwy 10 are fairly close which allows an angler to access the river without hiking, yet these are few and far between. For the avid biker and hiker, some of the best access to the Upper Canyon is via the John Wayne trail. This Upper Canyon is loaded with large boulders and offers minimal wading access at higher volumes. Water clarity is generally beautiful and the Cutthroat population is definitely more prominent in this stretch than any other stretch. When this stretch is at lower volumes there is good wading opportunities. Three major tributaries enter this particular stretch of the river; The Teanaway, Swuak and Tanuem. The Farmland stretch of the river probably has the most character featuring multiple islands and braided channels: truly one of the best stretches for trout food and spawning habitat as well as wading. Bordered predominantly by major cottonwood flats, the deer and elk population in this stretch is fairly high per mile. We generally like to fish it at lower volumes yet this section offers great fishing at all levels. There are certainly a good number of sweepers in this area of the river and there is a specific area we refer to as the “S” curves. At times over the years there have been complete blockages making it difficult for drift boats and the like. Although the wading is good at all levels, vehicle access is basically nonexistent. The Farmland stretch is bordered by major ranches and private access. The best way to fish this stretch in higher volumes is to float fish as well as float and get out and wade fish. During lower volumes there are a few put-in accesses that allow an angler on foot to explore. This stretch also has quite a few contributing streams that are definitely affected by field irrigation before they enter the river. The streams tend to be a bit off color and as one progresses downstream the final affecting stream is Wilson /Cherry creek which is the most significant in size and is a definite clarity inhibitor. Affectionately referred to as the “Yakima Canyon” this certainly can be some of the most prolific habitat on the river. Year in and year out probably the most fished stretch on the river. The Lower canyon is a very easy stretch to drift as it travels through a basalt and desert landscape that is as appealing to many as is the fishing. The sage brush country is home to many Bighorn sheep, deer and good hatches. General water clarity in this stretch is less due to the stream contributions that are listed above. The following is a basic hatch chart for the Yakima. I don’t claim to be an entomologist and trout don’t speak Latin, yet understanding the food sources that the trout key on will always help catch more fish as well instill an appreciation for the ecosystem it is part of. It is hard to speak only of the river in terms of trout and insects, yet it most certainly has a piece of many hearts. During a normal winter the river can fish incredibly well. If there is a month that one might just want to stay home, hug the kids and drink hot beverages instead of fishing the Yakima it would most likely be January. Yet some of the largest trout I have personally seen on the system have been caught during the month of January. 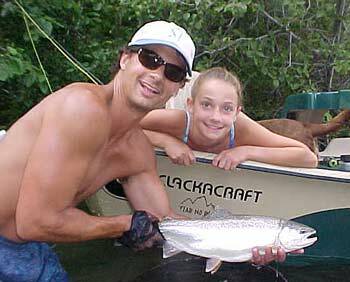 Over the years I have personally witnessed exceptional fishing in every month of the year. Streamers, Streamers, Streamers Streamer Techniques of Winter include fast and slow presentations. Nymphing—Dry Droppers and Indicator style. Nymphing generally in slower deeper water yet with good midge hatches you will find trout in the shallow riffles. Dry Fly fishing is fairly slow other than the Midge hatches which can be fairly prolific. Wet fly Fishing with midge soft hackles. Nymphing—Dry Droppers and Indicator style Nymphing generally in the slower to medium fast waters. Can be incredibly automatic for big fish. Dry fly fishing is more of a searching type fishing and covering water; except for the last Hour where all heck can break lose and there will be plenty of targets to cast to if you can see! Wet Fly tactics specifically with the Caddis, Yellow Sallies and Cahills. Dry fly fishing to rising fish with decent dry fly searching. Rises can be prolific! Nymphing can be unbelievably automatic for numbers as well as big fish. Small nymphs! If I were to pick my favorite period it would undoubtedly be this time of year, partly because of the Skwala Stone fly hatch that occurs on the river during this period. This hatch is the same one that occurs on the Bitterroot, Clark Fork, the Blackfoot and other western rivers and is assuredly one of my favorites. Pre runoff, offers clear, cold water, insects(Blue Wing Olives, March Browns) and hungry post spawn big trout. Generally there is less people and ample wildlife. Overall not a numbers game but definitely good fishing. Mid April-Mid Jun: This time period is fairly ambiguous as it depends on how mother nature deals her card as to actually when the snow melt happens. Typically the snow doesn’t all come at once and will generally come in stages between April 15 and June 15. Remarkably the fishing can be great during run-off, and it can also be quite poor. If I were to choose a place to be fishing when the river is big ugly and brown it would be the lower canyon. The trout will rise to the surface and feed rhythmically with brown water in the lower canyon assuming there is a great hatch. 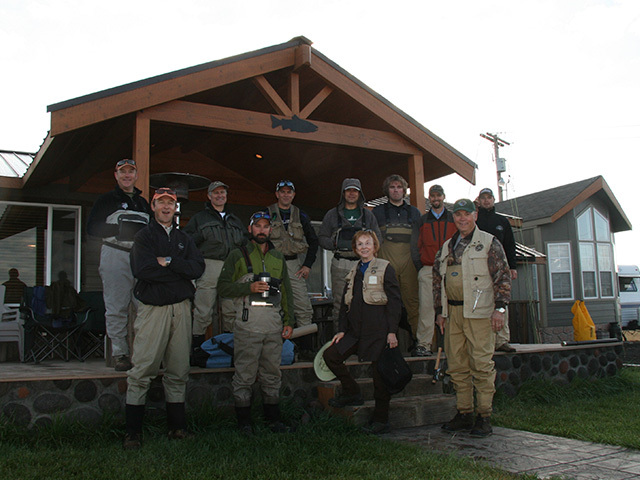 The predominant hatches the lower canyon offers during the run-off period include March Browns and Caddis. There are others insect during that period yet usually the aforementioned is the most significant to the trout for rising patterns. Streamer fishing and nymphing can also be productive. Some of the best of the Caddis and PMD’s are during this time which can make for a full day of dry fly fishing. We also experience some average Salmon Flies and Golden Stones hatches as well. Water flows can be a bit up and down at this time of year as the releases for irrigation are based on demand and the fluctuations can affect the river at times. This is also Green Drake season on the; Chasing elusive Drake Hatches is a passion for many as the infamous Drake is never predictable and always elusive. Yet if you catch it right on the Yakima or any other Western Stream it can be leg wobbling! Hoppertunity and Summer stoneflies! Casual attire, usually wet wading and covering large amounts of water by boat is the general fare. The Hopper/Stonefly dropper combo can be the best bet and the evenings can be incredible as the Caddis and the Stoneflies come out to play. The Flip Flop-This occurs on or around the 1st of September when the flows of the Yakima decrease incredibly due to the lack of water needs from the upper Yakima River basin. What this boils down to is that the river will artificially drop from approximately 3800CFS to 1200 CFS within a two-week period. This is the best of the best when it comes to fishing “far and fine” on the Yakima. If I were to pick the best of the Fall I would say that it would be the last week of October and the First week of November. Yet on Dec 2nd , we hooked 117 fish standing in one zone for three hours. This would be the period that most people would say you are absolutely crazy to go fishing! However we have had incredible fishing during this time as the water is fairly predictable. We have also caught some of our largest fish at this time of year! Hopefully this information has been helpful…..Please visit us at our Fly Shop just off of the #109 exit in Ellensburg for the most up to date info on the river.